Segmental retaining walls can be installed in a wide variety of colors, sizes, and textures. They can incorporate straight or curved lines, steps, and corners. They’re ideal for not only slope support, but also for widening areas that would otherwise be unusable due to the natural slope of the land. Retaining walls are often used for grade changes, and for other functional reasons such as widening driveways, walkways, or creating more space in a recreational outdoor area. Of course, soil composition is a critical factor in how and where a segmental retaining wall can be built. The soil should drain well so that it will not hold water. Water tends to be the one thing that will cause problems and negatively affect the structure. For example, there may be a water source getting in behind the wall that may loosen up the compacted base, causing settling and shifting. Once winter sets in, if the water is still present behind the wall it will freeze and expand, causing the wall to buckle and shift over the course of a couple years. Once you’ve determined that you have the right soil and topography to successfully install a segmental retaining wall, it’s important to do the appropriate prep work prior to starting construction. Contact local utility services to identify location of underground pipelines, conduits and utility lines. Check with local building officials or residential inspection services to determine any requirements for construction certificates or inspections needed. This is often a requirement when retaining walls exceed four feet. Coordinate delivery and storage of materials to ensure unobstructed access to the work area and materials. Review the supplier’s recommended installation and structural requirements. 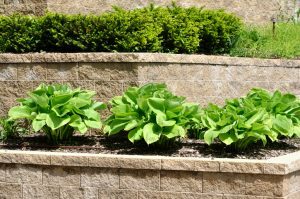 If you know your environment and do your homework up front before you start your retaining wall project, it’ll help ensure that you’ll have an attractive, functional, and reliable segmental retaining wall that will provide years of service.